Prints and cover for the now rare World Spirit Tarot deck and book. 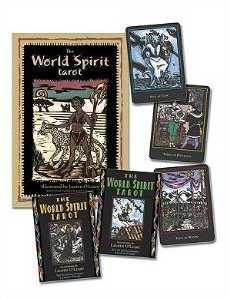 A prolific artist and writer, in 1999, she released the World Spirit Tarot. Illustrated and co-authored by Lauren O’Leary, with Jessica Godino, it was published in both English and Spanish 1999 by Llewelyn Worldwide. Described as ‘an instant classic’ upon release, and now out of print, an independent re-print is tentatively scheduled for 2015. The now hard to find deck can be purchased on Amazon. Under both the names Lauren O’Leary and Madame Onça, she has written dozens of articles for dance trade publications, in magazines such as Yallah, Belly Dance Chronicles, Zaghareet, Fuse, Tribal UK magazine, and Big Top. She also has numerous illustration cover credits through Llewellyn Publishing and related publications from 1999 to the present. Onça was also the cover model for October’s 2010 Zaghareet Magazine www.zaghareet.com. Madame Onça on the cover of Zaghareet Magazine 2010, photo credit Micah McKenzie.